Shut in again by near blizzard conditions and finished for the day with my “professional work,” I had two basic choices: cook or clean. Now let’s think…. How about cleaning out the pantry a little and cooking a lot? Since I had made bread earlier in the week, there were extra hunks getting stale, plus I had some apples that were ready to move on. The Dad regards bread pudding as one of the ultimate comfort foods, just the thing for the weather, so the choice was obvious. Back in December, I wrote a post about savory bread pudding made of roasted root vegetables left over from Thanksgiving, also obvious. I explained that bread pudding for me is an exercise in proportions. I use 2 eggs per cup of milk and 2-21/2 cups of bread. I then add 1-2 cups of other ingredients that wouldn’t soak up the liquid, plus seasonings. Coincidentally, I had a similar amount of cubed bread today, so the recipe below mirrors December’s except that for sweet bread pudding, add 1/3-1/2 cup sugar in proportion to the above. Mix any spices (ground cinnamon in this case) with the sugar so that they don’t just float in the liquid. This was not only delicious. It filled the house with a wonderful aroma and drove us to light a fire for a cozy evening inside, buffered from the howling winds all around us. Preheat the oven to 350 degrees. 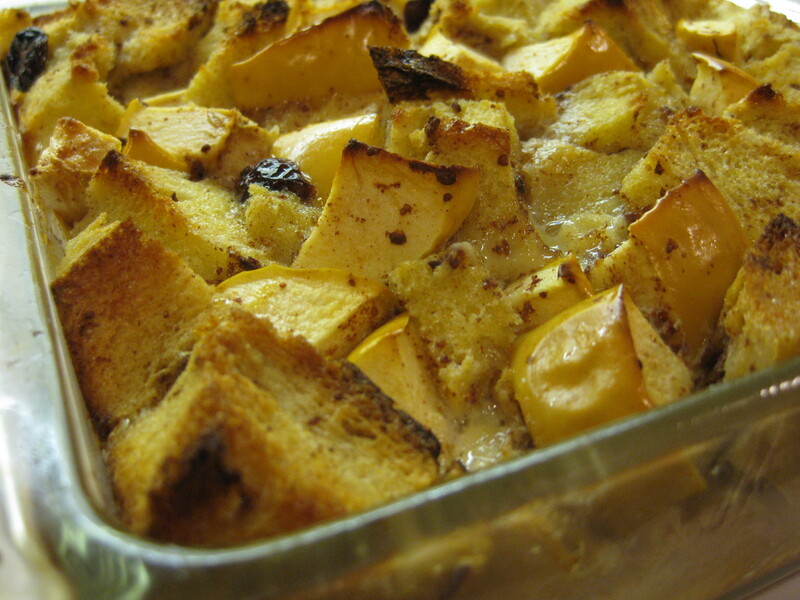 Mix bread, apples and dried cranberries in a buttered 10×10-inch glass or ceramic baking dish. Lightly beat the eggs, add the sugar mixed with cinnamon and then the milk, mixing thoroughly. Pour over the bread mixture and push down on the bread cubes to make sure they are saturated. Let rest for a few minutes to allow the bread to absorb the liquid. Bake for 45-50 minutes, or until the custard has set. It will continue to cook as it is set aside to cool.